The New Year could begin with a bang--or rather a solar flare. A sunspot hidden just behind the sun's eastern limb has unleashed two X-ray flares and a bright CME (coronal mass ejection) in the past 24 hours. This activity could signal the return of large sunspot 978, which has spent the last two weeks transiting the far side of the sun. Today or tomorrow, the sun's rotation should carry the active region over the limb and into view from Earth; then we can evaluate its potential for more flares and CMEs. 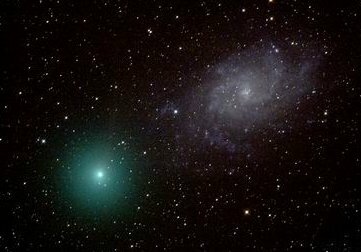 "The emerald-colored comet and M33 were a fantastic late Christmas gift for me," says Gerald DeShirlia who photographed the encounter from his drive way in Wimberley, Texas, using a 7-inch refracting telescope and a Canon 20D digital camera. Now Comet 8P/Tuttle is heading toward Earth. On Jan. 1st and 2nd it makes its closest approach to our planet--only 24 million miles away. The emerald-colored comet will brighten to a predicted magnitude of 5.8, visible to the unaided eye from dark-sky sites and a fine target for backyard telescopes. sky map.